The Autonomic Nervous System (ANS) consists of two branches. The sympathetic nervous system also known as Fight or Flight and the parasympathetic nervous system sometimes referred to as Rest and Digest. The sympathetic nervous system excites the system for survival whilst the parasympathetic nervous system maintains homeostasis within the body. In my post, Stressed? Exercise, Yoga, Mindfulness, Repeat, I wrote about the impact of stress on the autonomic nervous system. In this post I wish to speak about some of the specific benefits Yoga can offer to the healthy maintenance of the ANS in particular. 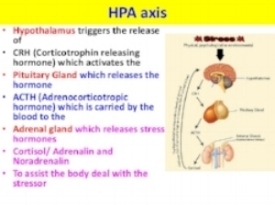 Yoga can help to restore equilibrium to the Hypothalamic Pituitary Adrenal axis (HPA axis). This is a stress response whereby cortisol, adrenaline and noradrenalin are released into the body to deal with the stressor. This axis is consistently triggered by stress and can be overloaded whereby it does not switch off. We know that too much cortisol in the body causes disease. Evidence shows that yoga has an immediate quietening affect on the HPA axis, largely caused by parasympathetic activation through the practice of Ujjayi and other pranayama techniques. The major parasympathetic nerve in our body is the Vagus nerve. Vagus means wanderer. This nerve wanders throughout the trunk sending and receiving messages from the organs to the brain and vice versa. When practicing pranayama that activates the parasympathetic nervous system, the vagus nerve sends a message of calm; it tells the organs and the brain that all is well; all can function normally, hence Rest and Digest. Yoga activates Heart Rate Variation (HRV). You will no doubt have heard of interval training. This is an extreme version of HRV, whereby we get the heart pumping fast and then restore it to it's natural rate by resting. In yoga we exercise the heart through stronger, more active poses and then restore and relax it through quiet poses and calming pranayama. Exercise is in itself a sympathetic nervous system trigger. The more we practice variety, the easier it is for the ANS to understand that whilst the sympathetic nervous system may be triggered, we have the means of calming it. Each time we actively practice parasympathetic activity, the system calms more quickly. In yoga we often practice both simultaneously; when holding strong poses and using Ujjayi breath at the same time! With practice, a healthy heart responds quickly to being restored to it's resting rate which in turn teaches the ANS that we can return to a natural state of parasympathetic rest and digest after stress. Yoga helps in a variety of ways. It improves posture; lengthening hyper tense muscles for improved blood flow. We know that pranayama induces parasympathetic activity, negating the impact of sympathetic arousal. Furthermore, the practice of yoga focuses the attention on the physical body and the breath, diverting our attention from the busy mind. With the addition of mindfulness practices, it is easy to see how truly beneficial these actions will be on a person suffering from Hypertension as well as a number of conditions that have arisen as a result of long term stress. Whilst medication is often the first port of call and a necessary one for hypertension, particularly if blood pressure is dangerously high, it may be considered a short term resolution. Evidence shows that yoga can bring about powerful change on conditions relating to stress. So with advice from your GP, why not give it a try? It should be noted that for certain conditions, a general class may not be suitable. Yoga should be taken in a one to one capacity. In writing this article I referenced not only the article above, but also the wonderful teachings of Heather Mason of The Minded Institute with whom I trained in Yoga Therapy for the Mind and the brilliant book by Mel Robin: 'A Handbook for Yogasana Teachers'.